Put a Cast Iron Grill Pan on a high heat. To know when the pan is hot enough, a drop of oil will separate when dripped into the pan. Place the steak into the pan and grill until slightly browned. Add the garlic and onions and continue to cook until well brown. Remove beef and onions from the pan and allow it to cool while you prepare the salad. Place the lettuce, onion, radishes and tomato into a large bowl and toss. Once the meat is cool enough to touch, add to the bowl and toss. 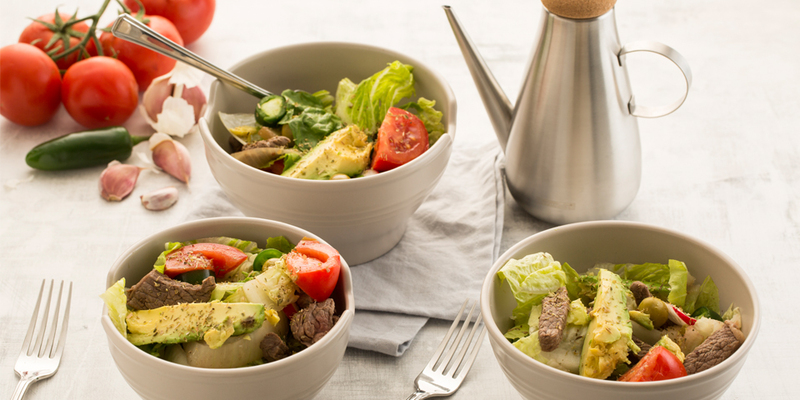 Serve in salad bowls and garnish with the avocado, olives and jalapenos to taste. Combine the ingredients in a Typhoon Seasonings Drizzler. Shake liberally to combine the ingredients and immediately before pouring.